Aspergillus flavus is a fungus. It grows by producing thread like branching filaments known as hyphae. Filamentous fungi such as A. flavus are sometimes called molds. A network of hyphae known as the mycelium secretes enzymes that break down complex food sources. The resulting small molecules are absorbed by the myceilium to fuel additional fungal growth. The unaided eye cannot see individual hyphae, but dense mats of mycelium with conidia (asexual spores) often can be seen. The ear of maize below shows the growth of the fungus covering four maize kernels. When young, the conidia of A. flavus appear yellow green in color. As the fungus ages the spores turn a darker green. In nature, A. flavus is capable of growing on many nutrient sources. It is predominately a saprophyte and grows on dead plant and animal tissue in the soil. For this reason it is very important in nutrient recycling. Aspergillus flavus can also be pathogenic on several plant and animal species, including humans and domestic animals. The fungus can infect seeds of corn, peanuts, cotton, and nut trees. The fungus can often be seen sporulating on injured seeds such a maize kernels as shown above. Often, only a few kernels will be visibly infected. 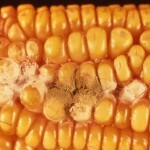 Growth of the fungus on a food source often leads to contamination with aflatoxin, a toxic and carcinogenic compound. Aspergillus flavus is also the second leading cause of aspergillosis in humans. Patients infected with A. flavus often have reduced or compromised immune systems. The epidemiology of Aspergillus flavus differs depending on the host species. 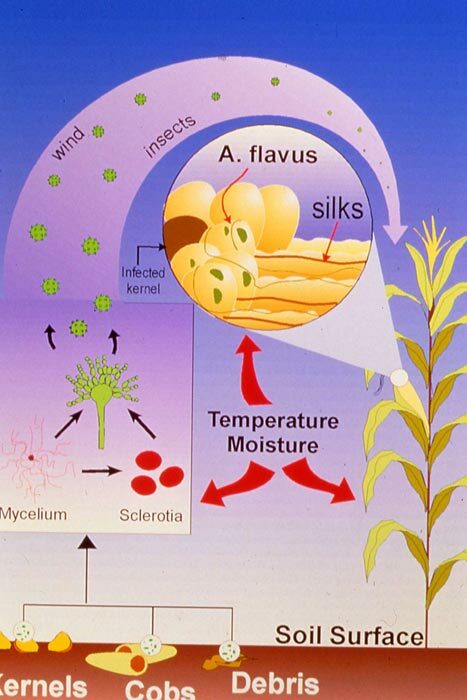 The figure to the left shows the life cycle of the fungus on maize. Click on image to view larger. The fungus overwinters either as mycelium or as resistant structures known as sclerotia. The sclerotia either germinate to produce additional hyphae or they produce conidia (asexual spores), which can be dispersed in the soil and air. These spores are carried to the maize ears by insects or wind where they germinate and infect maize kernels. Unlike most fungi, Aspergillus flavus is favored by hot dry conditions. The optimum temperature for growth is 37 C (98.6 F), but the fungus readily grows between the temperatures of 25-42 C (77-108 F), and will grow at temperatures from 12-48C (54-118 F). Such a high temperature optimum contributes to its pathogenicity on humans. Payne, G. A. 1998. 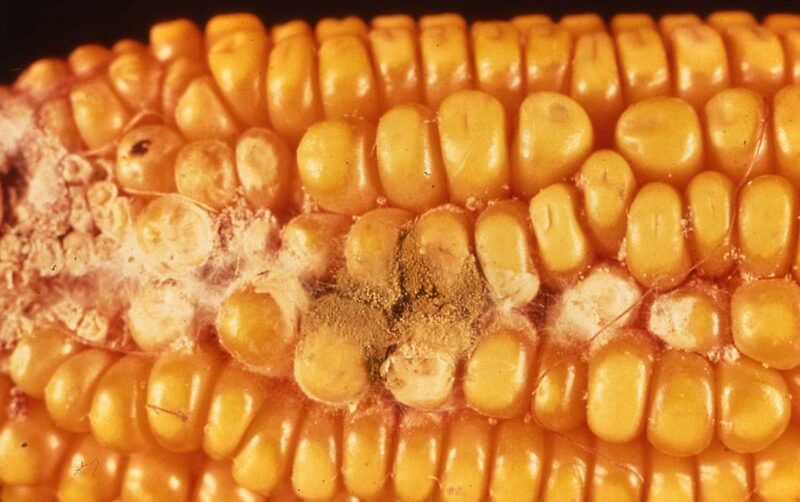 Process of contamination by aflatoxin producing fungi and their impacts on crops. 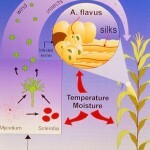 In, Mycotoxins in Agriculture and Food Safey. K.K. Sinha and D. Bhatnagar. Marcel Dekker, Inc. New York. Payne, G. A. and M. P. Brown. 1998. Genetics and physiology of aflatoxin biosynthesis. Annual Rev. Phytopathology. 36:329-62. Scheidegger, K. A. and G. A. Payne. 2003. Unlocking the secrets behind secondary metabolism: A review of Aspergillus flavus from pathogenicity to functional genomics. Journal of Toxicology-Toxin Reviews. 22(2-3): 423-459.